Last August 11, we flew to Davao for the Google Apps Challenge Meetup held at the PLDT-SMART Ponciano Business Center. GDG Davao community manager Andrew dela Serna, Googler Dan Delima, GDG Bacolod community manager Anne Olvido and I were the speakers in the event. I talked about the basics of Google Drive API and SDK. After the event, we had dinner at Lachi's Sans Rival Atbp and strolled in SM City Davao. The next day, we had lunch at Delongtes Seafood Grill And Barbecue. I also ordered Durian Shake. Then, I tried the Zorb and we strolled around Abreeza. 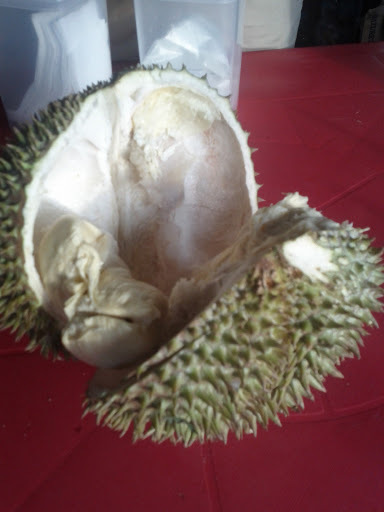 We went to Magsaysay Park to try durian. After that, we went back to get our stuff, had dinner and went straight to the airport. Our weekend in Davao was great! I would love to go back there again soon!